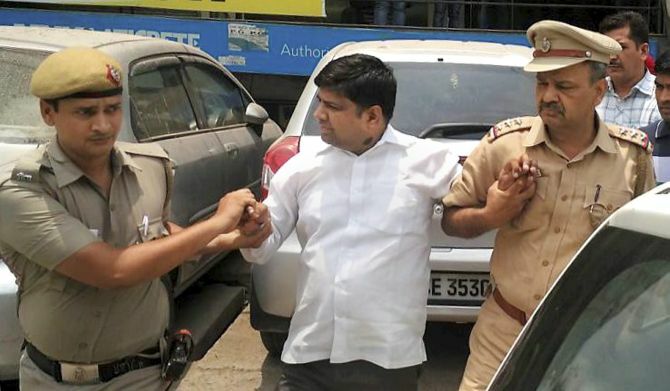 Aam Aadmi Party member of legislative assembly Dinesh Mohaniya, arrested in a case of alleged molestation, was on Monday sent to judicial custody for 14 days by a Delhi court which rejected his bail plea. “There is no change in the circumstances in the last two days to interfere with the duty magistrate’s June 25 order. This second bail application of accused is dismissed,” Metropolitan Magistrate Bhavna Kalia said. The duty magistrate on Saturday had denied him bail and sent him to Tihar jail for two days till Monday. The MLA was booked on June 23 for allegedly misbehaving with a group of women who had approached him with a complaint regarding water crisis in their locality on the previous midnight. A first information report was lodged at South Delhi’s Neb Sarai Police Station. Mohaniya has been arrested under Sections 323 (voluntarily causing hurt), 506 (criminal intimidation), 509 (word, gesture or act intended to insult the modesty of a woman), 354 (assault or criminal force to woman with intent to outrage her modesty), 354 A (sexual harassment), 354 B (assault or use of criminal force to woman with intent to disrobe) and 354 C (voyeurism) of the Indian Penal Code. Opposing the bail plea, police submitted before the court that if relief was granted, Mohaniya could influence the probe which was still on against the other accused persons. Senior advocate H S Phoolka, appearing on behalf of the politician during in chamber proceedings, submitted that there was a delay of 11 hours in lodging the FIR and the offences alleged were bailable. He also told the court that the statement of a woman was recorded two days after lodging of complaint and there was no basis to consider it. The counsel said the allegations levelled against the accused were false as the gap of two days gave time to police to frame the politician. Phoolka also said the offence under section 354 (assault or criminal force to woman with intent to outrage her modesty) of the IPC cannot be attracted as there was no intention on the part of Mohaniya to molest or tear clothes of the alleged victims. Mohaniya, an MLA from Sangam Vihar, was arrested on charges of molestation and sexual harassment amidst high drama when he was addressing a press conference, triggering an angry reaction from Chief Minister Arvind Kejriwal who accused Prime Minister Narendra Modi of declaring an ‘emergency’ in Delhi. Mohaniya, who is also vice chairman of Delhi Jal Board, was virtually dragged from his seat by a police officer when he was talking to reporters at his office in Khanpur in South Delhi around 12.10 am. In their statements, the women alleged that Mohaniya had molested them during the tussle on the midnight of June 22 when they had gone to complain to him against water problem faced by them. In their complaint, they had earlier told police that the MLA and his men had verbally abused and threatened them. Another case has been registered against Mohaniya at Govindpuri Police Station for allegedly slapping a 60-year-old man in Tughlaqabad area on Sunday. Mohaniya is the eighth AAP MLA to be arrested by Delhi Police since the party came to power for the second time in Delhi in February last year.